Description: The price of admission for a hike up to Diamond Lake can be high on a summer weekend, but it is well, well worth it. 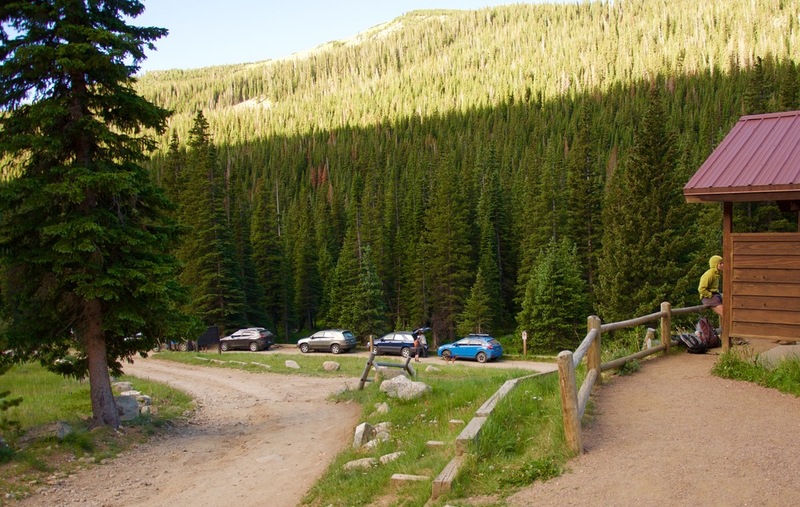 The trailhead is reached via four miles of very rough Fourth of July access road out of Eldora, CO, that is just barely manageable for most two wheel drive cars. That four miles alone can take 20-25 minutes to traverse. And even getting there at 7:00 a.m. it can be a fight for one of the limited parking spaces at the trailhead. Moral of this story? Hike Diamond Lake on a weekday if you can. Regardless of when you hike it, it is a gorgeous trail. I found myself enjoying the trail more than the lake itself. It alternates between open vista trail where you're subconscious will have you humming the theme to Sound of Music, and dark, pine-shadowed path that can leave you feeling a bit like your name is Hansel or Gretel. In early summer the trail abounds with water crossings from snow melt providing some impressive cascade falls. Diamond Lake presents some great places to picnic in the grass along the trail that runs around the western shoreline. As a fly fisher I'd been wanting to make my way up Diamond early in the summer to find out if the trout were as accommodating as I'd heard. They weren't. But, then again Linda always says I was voted the #1 fly fisherman by the happy, healthy trout of Colorado, so maybe it was just me. Regardless, it was a good day for a hike, a lunch and to wet a fly on a beautiful lake. Challenge Level: Moderately Difficult, 6.0 Miles, 1450' Total Elevation Gain, 4 to 5 Hours - This hike is difficult for me to judge because I injured my left plantar fascia (yeeowwwch!) as I approached the lake, which made the return trip feel a lot longer and a lot tougher than it probably was. So if you think, "hey that was easier than he said! ", you can thank my injured foot. In early July the trail had a lot of water on it and contained several marshy areas with older, rotting boardwalks requiring care and balance. There were a few rock gardens as well, but nothing out of the ordinary for a hike at this altitude. Most of the difficult ranking comes from the combination of starting altitude, total elevation gain and some rocky bits. On the plus side you will want to spend some time up on the lake so you will be well rested before your return. I saw several hikers with poles and I can see how they could be beneficial for some water crossings and boardwalks. Parking: There are probably about three dozen official parking spots at the Fourth of July trailhead, but when I left there around 2 one Saturday in early July there were easily 60+ cars jammed along the side of the road and in the parking lot. Come early to avoid parking problems if you are hiking during peak summer months. Buckingham Campground is also located at the trailhead. Trailhead: Officially, Diamond Lake trail begins about a mile into the hike, meaning you will start out on the Arapaho Pass Trail. The trail is located in the upper back of the parking lot. There is a map and notice board. The trail has been recently rerouted so it may be a bit confusing as to which trail to start on. Head uphill on the steeper stepped trail that starts behind the small wooden trail mileage marker. 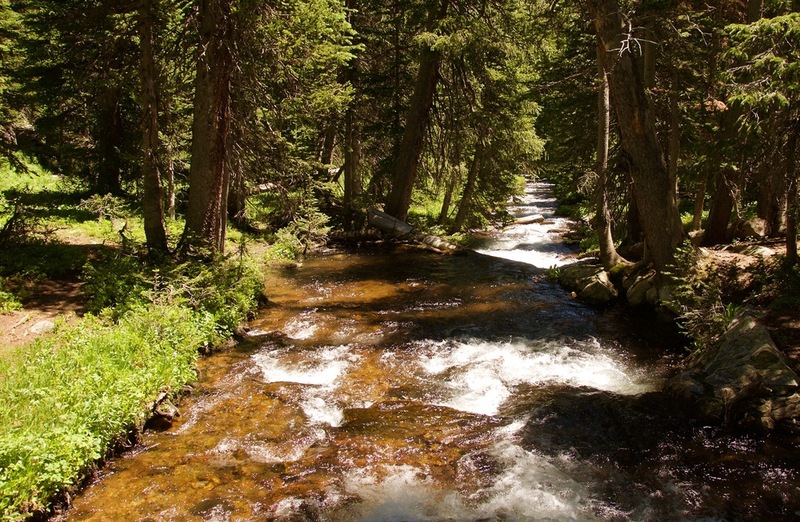 Trail Guide: You'll start out on the Arapaho Pass Trail as it climbs upward on the north side of the valley. About a mile into the hike you will come to the split where Diamond Lake Trail starts. Stay straight following the sign to Diamond where you will continue to climb for a short while and then drop into the drainage of the North Fork of Middle Boulder Creek (some creative drainage naming, no?) Before you cross the bridge head to the right to take a look at the large cascade and take a rest before you make the last assault up to Diamond, which is about a mile from the creek. You'll return the way you came, after of course a nice picnic and nap by the lake. Après Hike: By the time I hobbled back to my CrossTrek with my sore plantar, bumped and scraped my way back down 4th of July Rd, and drove into Nederland I had a powerful thirst for some hoppy goodness. I'd heard of the Very Nice Brewing Company from some friends and dragged my sore body into their Caribou Village Shopping Center tap room for a pint (or two) of their Royal We IPA. I was not disappointed. Give them a try next time you are in Nederland! You'll find them located at 20 Lakeview Dr Suite 112, Nederland, CO 80466. Picnicking: Many beautiful options at Diamond Lake, but I do not recall seeing any picnic tables at the trailhead.